Higher Ground, held every two years, features artwork by high school students from the Boise and West Ada Districts. Facilitated by BAM’s Education Department, the exhibition provides a professional exhibition experience for high school students, valuable preparation for developing a portfolio, and the opportunity to learn about the process of entering juried exhibitions. In January, 355 students from 11 local high schools submitted work for consideration. Jurors Goran Fazil, Assistant Professor of Art at the College of Western Idaho; Astri Snodgrass, Assistant Professor of Drawing and Painting at Boise State university; and John McMahon, Artist Services Director at the Idaho Commission on the Arts, reviewed almost 700 slides of student artwork. The 2019 Higher Ground exhibition features 52 works of art by 48 artists. 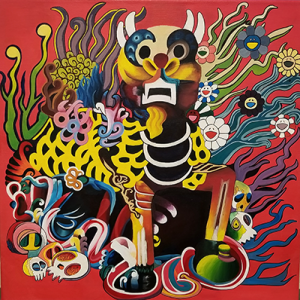 IMAGE | Mayra Arellano, Capital High School, Grade 12, Dragon, acrylic on canvas. 2019 Higher Ground Publication Award.